Accident investigation and risk assessment have for decades focused on the human factor, particularly 'human error'. Countless books and papers have been written about how to identify, classify, eliminate, prevent and compensate for it. This bias towards the study of performance failures, leads to a neglect of normal or 'error-free' performance and the assumption that as failures and successes have different origins there is little to be gained from studying them together. Erik Hollnagel believes this assumption is false and that safety cannot be attained only by eliminating risks and failures. The ETTO Principle looks at the common trait of people at work to adjust what they do to match the conditions - to what has happened, to what happens, and to what may happen. 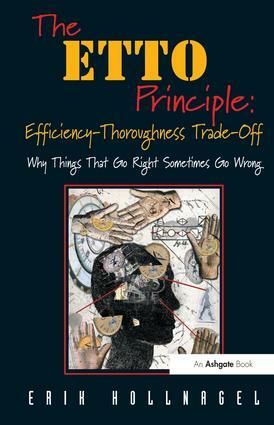 It proposes that this efficiency-thoroughness trade-off (ETTO) - usually sacrificing thoroughness for efficiency - is normal. While in some cases the adjustments may lead to adverse outcomes, these are due to the very same processes that produce successes, rather than to errors and malfunctions. The ETTO Principle removes the need for specialised theories and models of failure and 'human error' and offers a viable basis for effective and just approaches to both reactive and proactive safety management. Contents: Prologue; The need to understand why things go wrong; From rationality to ETTOing; Explaining human irrationality; Efficiency-thoroughness trade-off in practice; The usefulness of performance variability; ETTOs of the past; ETTOs of the future; Epilogue; Index. Erik Hollnagel (PhD, Psychology) is Professor and Industrial Safety Chair at MINES ParisTech (France), Professor Emeritus at University of LinkÃ¶ping (Sweden), and Visiting Professor at the Norwegian University of Science and Technology (NTNU) in Trondheim (Norway). Since 1971 he has worked at universities, research centres and industries in several countries and with problems from several domains, including nuclear power generation, aerospace and aviation, air traffic management, software engineering, healthcare, and land-based traffic. His professional interests include industrial safety, resilience engineering, accident investigation, cognitive systems engineering and cognitive ergonomics. Erik Hollnagel has published more than 250 papers and authored or edited 13 books, some of the most recent titles being Resilience Engineering Perspectives: Remaining Sensitive to the Possibility of Failure (Ashgate, 2008), Resilience Engineering: Concepts and Precepts (Ashgate, 2006), Joint Cognitive Systems: Foundations of Cognitive Systems Engineering (Taylor & Francis, 2005) and Barriers and Accident Prevention (Ashgate, 2004). He is Editor-in-Chief of the Ashgate Studies in Resilience Engineering series and, together with Pietro C. Cacciabue, Editor-in-Chief of the international journal Cognition, Technology & Work.